This might need to be amended also..
""The Committee will not establish common name standards. 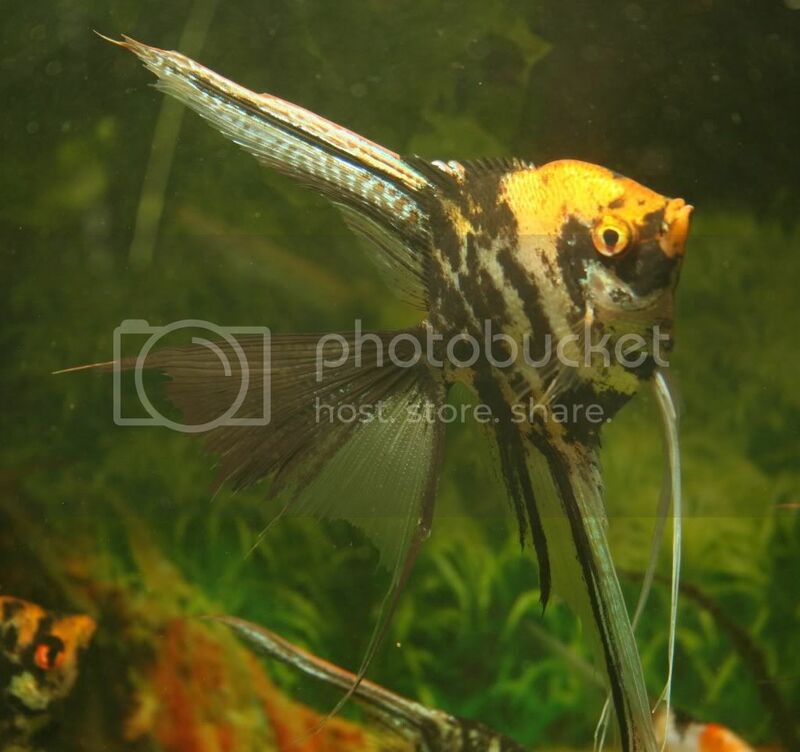 All TAS members that use common names for their angelfish, will agree to attach TAS gene names to their fish whenever the genes are known, so all can determine what strain is being acquired."" Just to be clear I am not suggesting we emphasize phenotype over genotype. I do however think we should take an active role in phenotype naming for two main reasons. That being educational purposes and stopping mass confusion. I don't think it's asking too much for us to take the lead on gene/genotype naming and also suggested the best fit phenotype name. I say best fit because we can't control what people will call a fish to make a sale or differentiate themselves from the competion. Look at Koi for an example, we have HR, Vermillion, high coverage, Tiger, Calico, Red, Orange, Lemon and Panda. All these names are used by someone to describe their fish or make the buyer think they are getting something new. In the end they are all still genetically (Gm/g - S/S or Gm/Gm - S/S) or Gold Marble Blushing (see I can use it). I'm not recommending that we start approving any or all of these names as a TAS function. Here is my idea in regards to what I think the standards committee should do keeping Koi as the example. Note; due to the nature of some recessive and masking genes the fish pictured could also carry other genes in single or double dose. To know for sure what genes your fish may carry please ask your breeder for the gene code or codes of the parents. I think this is how the Phenotype library should be set up. Please take notice that I said "phenotype" library not "genotype" library. If our founders were so dead set on genotype why is this so? Why isn't it the genotype library ..... hmmmmmmm. In fact I searched the TAS website and can't find any genotype library, table or basic naming guidelines. In most of the literature on the site anytime genotype is meantioned it is followed by the gene code/notation. Phenotype names are the predominate means of communication in the majority of the material. There is a reason for this, it's because that's what the majority speaks. I invision the phenotype library being set up like this for every phenotype so an inexperienced breeder could first identify the basic code for each fish and then be able to plug that into a calculator. Now I am Imaginearing at this point but it would be very cool if you could check a box next to the picture and it would automatically add it to the calculator. I appreciate that TAS doesn't have standards for Phenotype names, and is unlikely to, and even if it did, it's extremely improbable that all breeders & retailers would adhere to and abide by them. In general I like threads that meander from topic to topic, they're often the most creative, imaginative and useful. However, in the case of this particular thread, I deliberately started it to deal specifically with phenotype names, I didn't want to "further muddy the water" in a thread where there was already confusion between those who were talking about phenotype & those who were talking about genotype. Especially as that topic actually started off about "Panda Ghosts". For that reason can I suggest that further discussion on what should or shouldn't be included in the genetic calculator/breeding calculator should be continued in a thread specifically on this topic. Thanks. have you joined TAS yet? Not yet, I'm grateful to TAS for many things, in particular for allowing me as a non member to participate in this forum, and for making Dr Norton's articles available to all comers. However I'm not willing to be bound by TAS rules & regulations. I have a strong dislike for all bureaucracy, especially when it's self imposed; and I'm not keen on following the majority line, especially when the majority are "wrong" & I'm "right". Being in a completely different time zone from most of the TAS membership, would make it very difficult for me to participate in meetings etc, and anyway, I already waste too much time on line, I want to spend more time with my fish, not less! Yes and I offer my apologies for highjacking your thread. Let us continue with your initial intent for this thread. No apologies needed Damon, but thank you. I appreciate that there is no rigid rule on Phenotype names, but as previously stated, one of the reasons I started this thread was to try and get a handle on why particular phenotype names are adopted and to what extent people feel that a phenotype name can mislead. I write this not only from the perspective of someone who loves & breeds angels, and has a pretty good understanding of their genetics; but also from the perspective of a retailer, who realises that no one person can know everything there is to know about all fish! As a retailer, I know that the name of a fish is important to how well they sell. In my experience the general public, certainly in the UK, are easily embarrassed, so when they look in a tank of four different types of fish, it should be clear from the labels which is which. If the label says spotted catfish, the fish needs to be on the bottom of the tank & noticeably spotty. If the name is red platy, then it should be red, if not all over, it should have significant amounts of red, and that red needs to be red, not light pink! Next a name needs to be easily pronounced, most members of the general public struggle with words like gourami, ottocinclus, distichodus, plecostomus. That's why you'll usually see labels for Ottos, Discos & Plecs. Unfortunately when it comes to Gourami's there's no easy abbreviation, so we get used to "Gourmets", "Gorameys" and "Gore-mes". Finally a name needs to be succinct, Pearlscale Smokey Blue Marbled Veiltail Angelfish wouldn't fit on our labels for a start! I personally have been searching for the Marble gene. 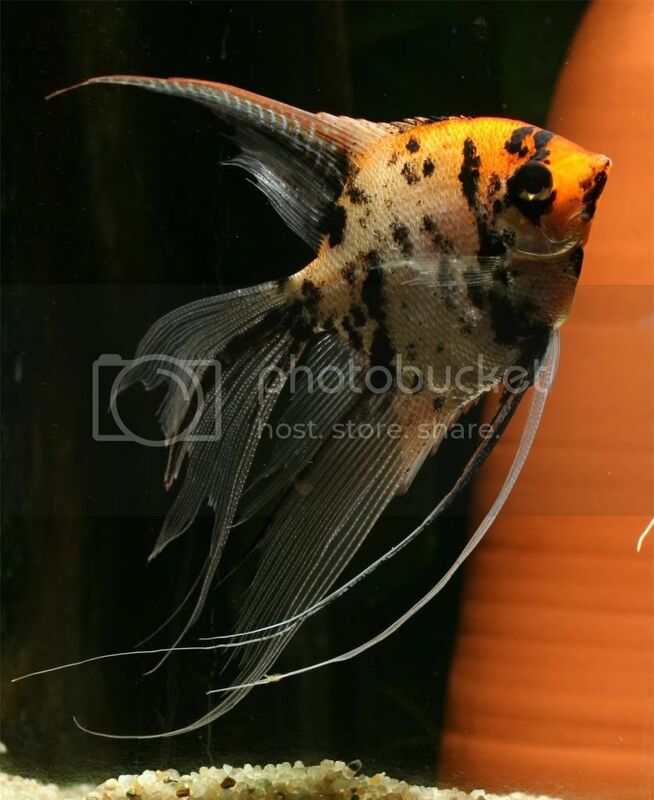 Shocking how everyone has the Gold Marble gene in their tanks, but not Marbles; or tell me they have Marbles, but photos clearly indicate this isn't the case. With smokey & chocolate it's fair to say that there is usually a marked difference between the two, but there are always fish that are borderline, especially when you add in stripeless & streaked genes, both of which reduce the amount of smokey chocolate pattern. Then throw in zebra and you have a "leopard angel", personally, at the shop, I put all together as assorted smokey angels, but if someone's after a specific genetic type, I do my best to select one for them. On the other hand M/+, M/g, M/Gm, & M/M are all technically lumped together as "Marbles", I think this is tolerable although there's a lot of variation between those types. When it comes to Gm/+, I call these light marbles, rather than "silver gold marbles" as this latter rule falls foul of my "if it's called gold it needs to have some gold" principle. Just to be clear I am not suggesting we emphasize phenotype over genotype. I do however think we should take an active role in phenotype naming for two main reasons. That being educational purposes and stopping mass confusion. Damon, I sent you 3 emails related to both this new thread of Rob's (Rob, thanks for opening this thread; it helped my thoughts transcend the road-blocks) and the meandering thread that fueled us going in circles. I was going to put up another thread until I saw this one. I'll post its contents after I hear from you and only if you're comfortable with my thoughts. I think we're on the right track and just need some very minor tweaking to make this a non-issue.